I am not going to lie: working for Two Paperdolls and Louella Press certainly has its perks when it comes to planning a wedding! I was very fortunate to begin working here almost a year ago while beginning to get into all the nitty gritty details of my September 2008 wedding, and in preparing for our big day I have been able to make use of some of the amazing resources just oozing out of this place. 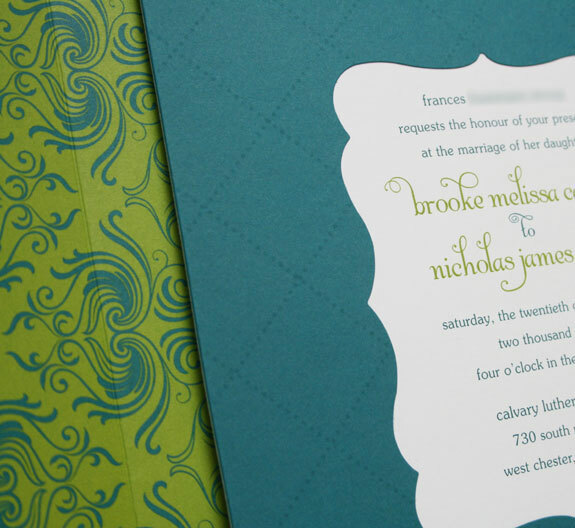 The prime example: our beautiful engraved wedding invitations. 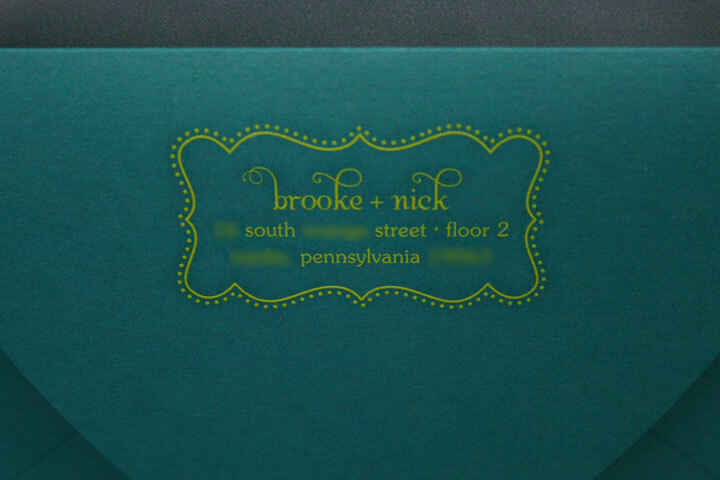 Close-up of the envelope liner and the invitation. 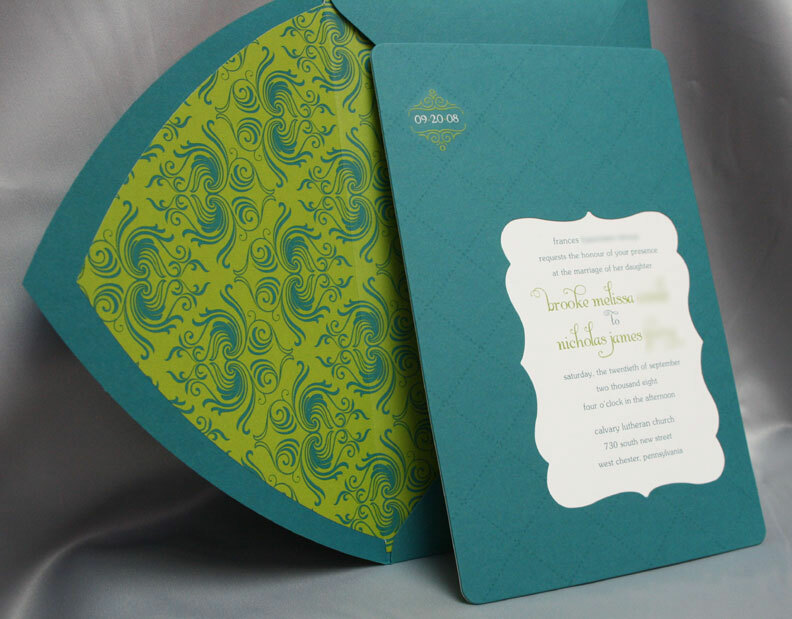 The top teal layer of the invitation is die-cut with the scroll shape, and layered on top of the white layer with our actual wedding info. 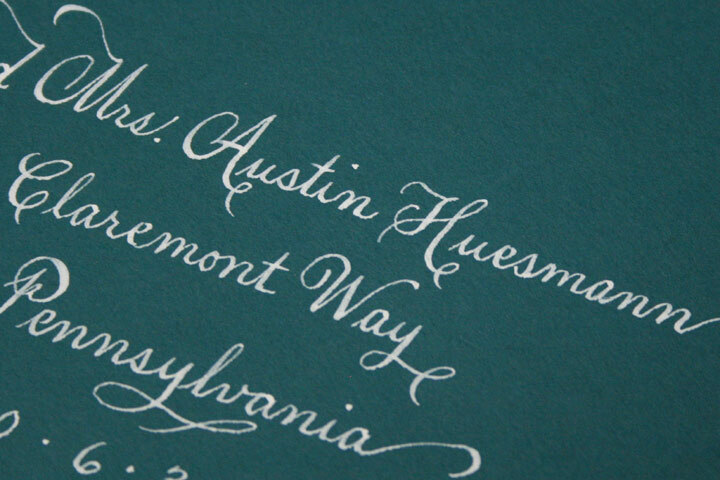 Basically, engraving is the only process that allows the ink to sit on top of the paper, creating both crisp ink definition and a raised texture. The back side of the paper is “bruised” from the pressure of the engraving process, giving it a delectable hand-touched feeling (which is illustrated in a photo further down in this post). 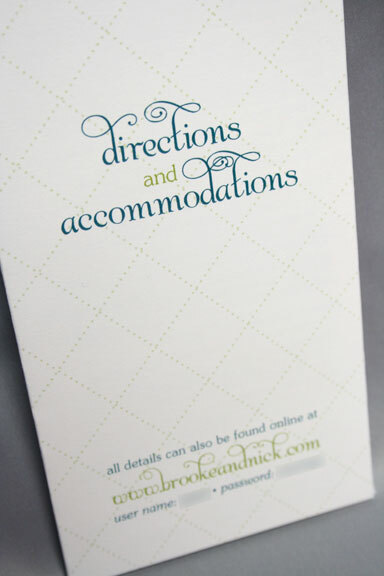 Thermography is also raised printing, but it creates a shiny effect (which, personally, I am not a fan of), and does not create bruising. 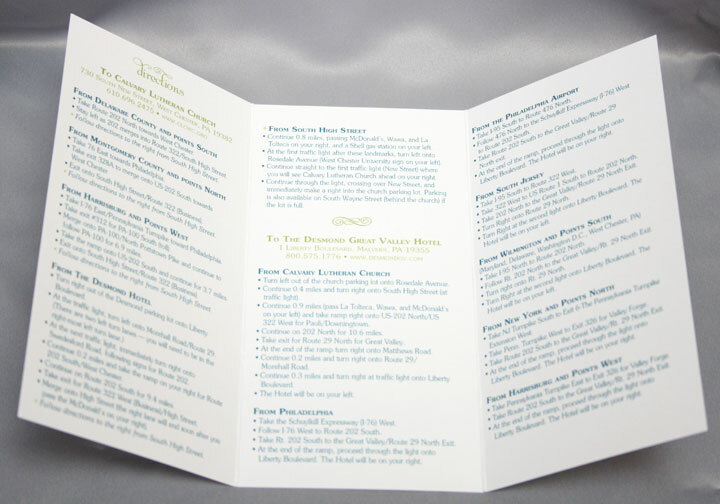 The raised effect of thermography is a result of a resin powder that is applied to an offset printed piece, rather than the pressure of the engraving process. I have to thank fellow doll and Louella Court contributor, Maggie, for taking pity on my poor, pathetic camera and letting me borrow her fabulous camera to capture these detailed photos for you (thanks, Maggie!). Below is a bit more invitation eye-candy that resulted from my little glamour shoot and hopefully these photos will help you see what engraving allows you to do. I love how the envelope liner ties it all together! The vector art pattern was purchased on istockphoto.com and I modified the colors and tiled the seamless pattern in Adobe Illustrator. The envelope liner was flat printed (also referred to as “offset”), because engraving would have been a little ridiculous and the amount of coverage would have made it extremely difficult for our engraver. 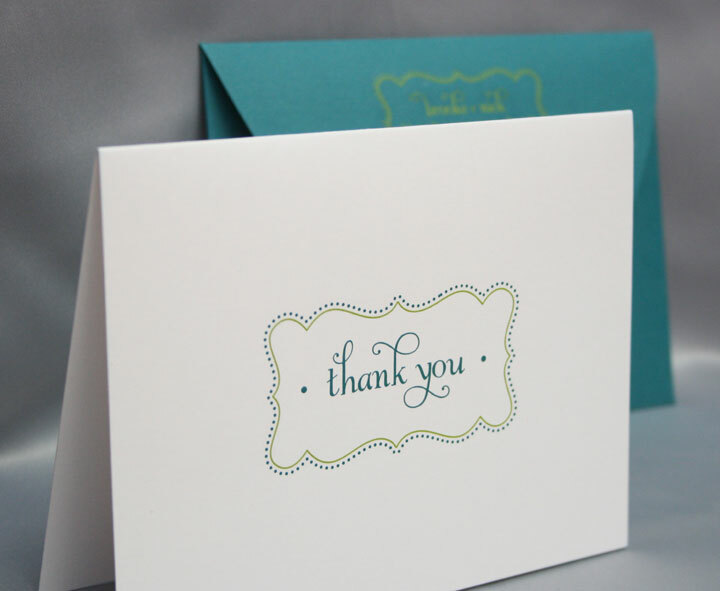 My absolute favorite detail…. I put an asterisk after “dancing” and added this line at the bottom. I think it’s charming, if I do say so myself! 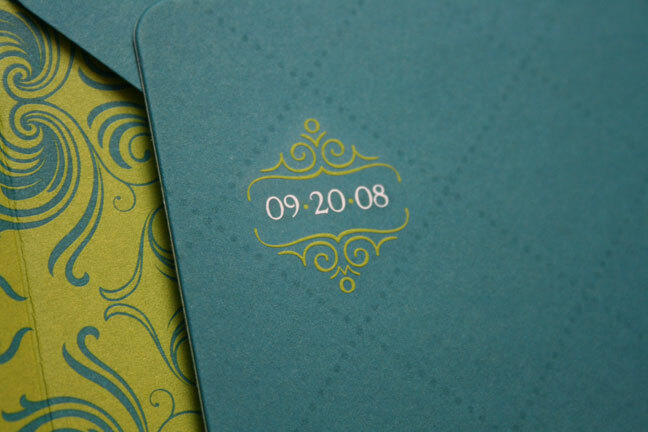 This close-up really illustrates the texture of engraving. 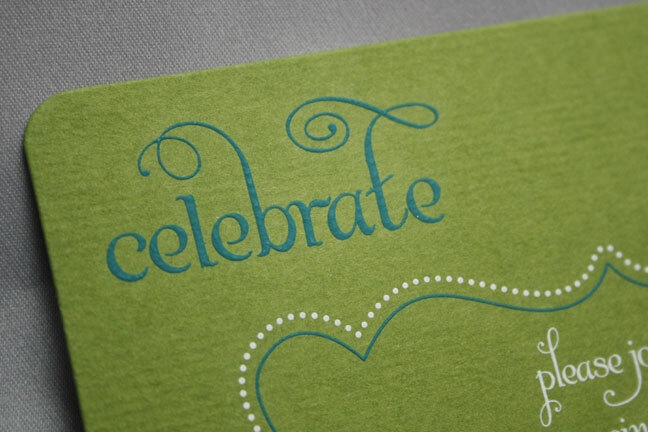 See how there is actually some dimension to the word “celebrate” sitting on top of the paper? 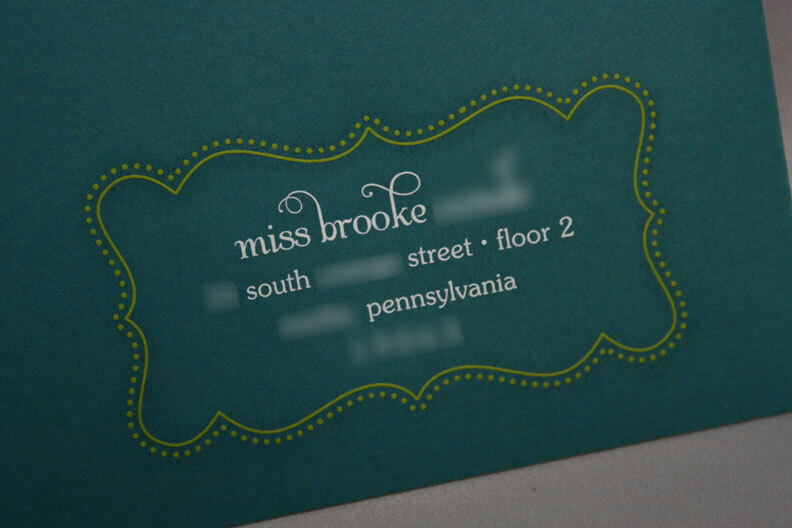 And here is what the back of the reception card looks like. 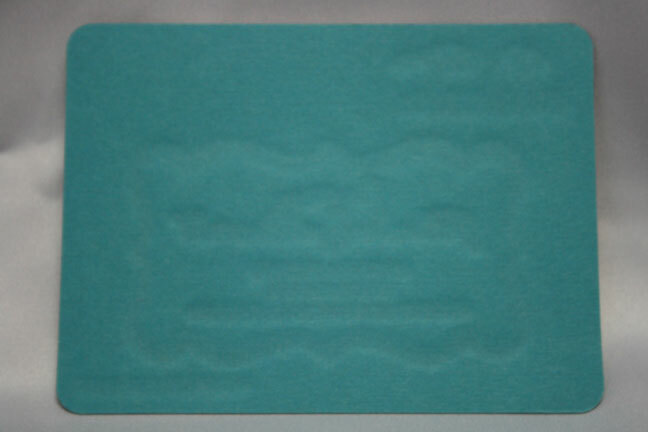 I had it duplexed with teal stock to add a little surprise element of color to the back of the card, but what I really want to show you is the bruising that occurred from the engraving process. 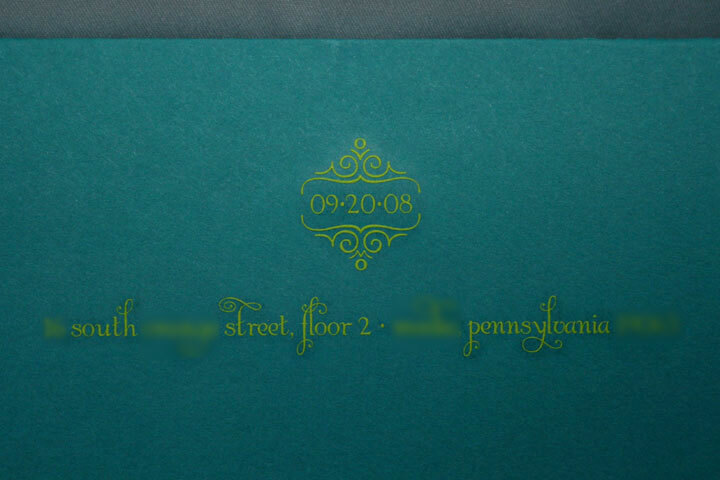 You can see the indentation of the scroll shape as well as where all of the type is. Isn’t that fabulous? 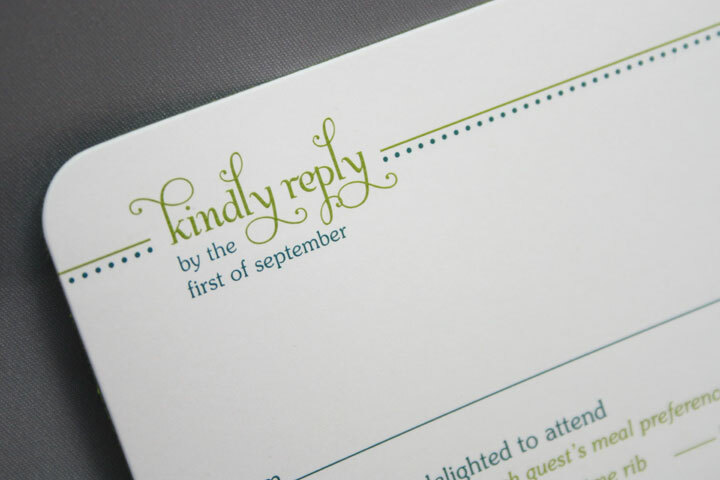 I couldn’t bear the thought of mismatched stamps after all of the work I put into the invites, so I bit the bullet and ordered custom stamps from Zazzle. I requested expedited service since I had put off getting my stamps — I ordered them at 10 a.m. on a Wednesday morning and received them at 10 a.m. the following day, from California! Not bad for $18.99 extra, and totally worth it to get these in the mail a little quicker. 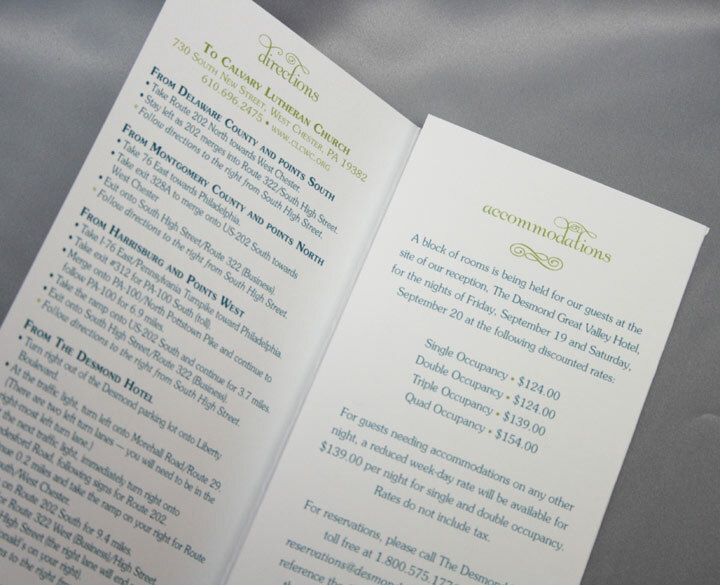 I flat-printed our directions and accommodations insert. I made it a tri-fold to include every ounce of information our guests could possibly need! If you ever doubted how committed I am to details, I’m sure there’s no denying it now! So, there you have it! I fully realize how completely fortunate I am to work in this place with all of these spectacular resources, and I probably would have had a much more difficult time trying to coordinate all of the engraving details on my own without the help of some generous colleagues. 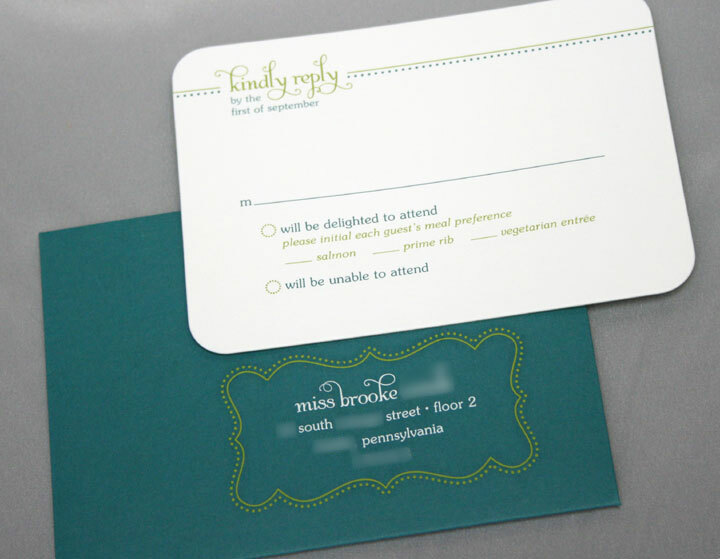 All of the hard work paid off as the invites have been getting rave reviews from our friends and family. 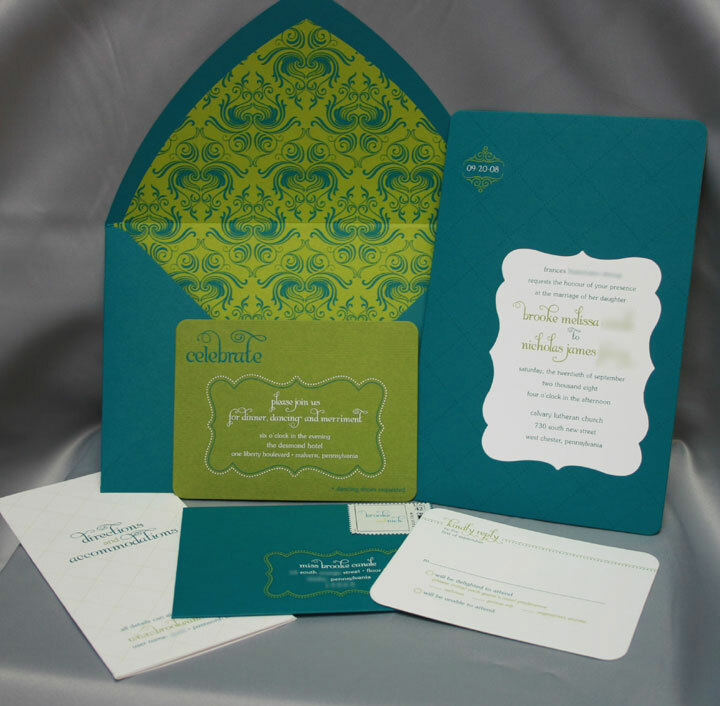 And, hopefully this invitation suite will open the doors for some other new and innovative designs here at TPD and LP, as we’re always looking for a challenge! This entry was posted on August 13, 2008 at 11:18 am and is filed under Around the studio. You can follow any responses to this entry through the RSS 2.0 feed. You can leave a response, or trackback from your own site. awesome job! they are beautiful. i’m a designer too so i understand our obsession to details. i wish i was invited to your wedding tee hee. These are so completely stunning I drooled over them from the moment I saw them! I love them! 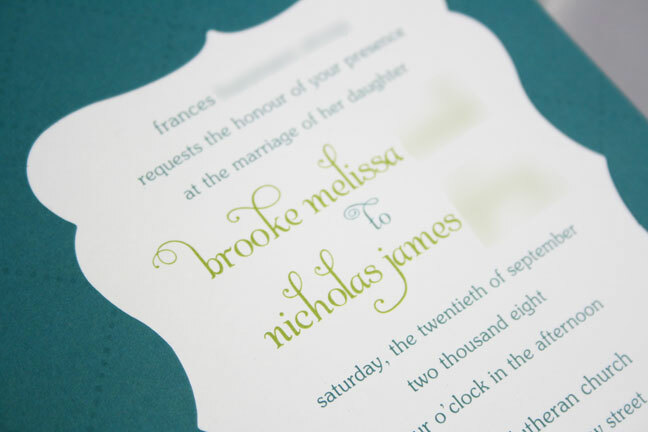 The embossing & engraving on these invitations are exquisite!! 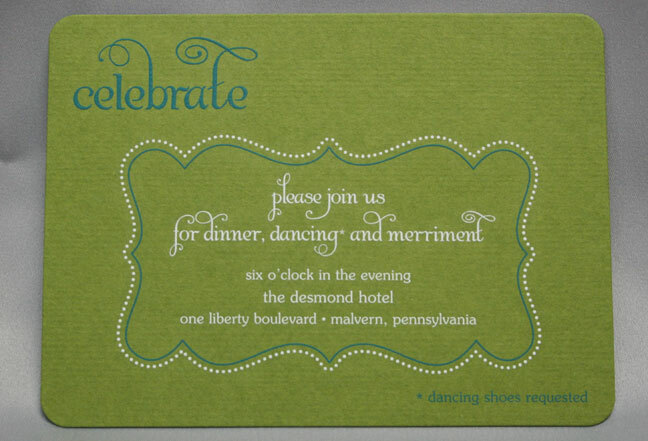 The raised print really adds and to the feeling of this being a *special* day, not just your run-of-the-mill party. Beautiful! These are all stunning! 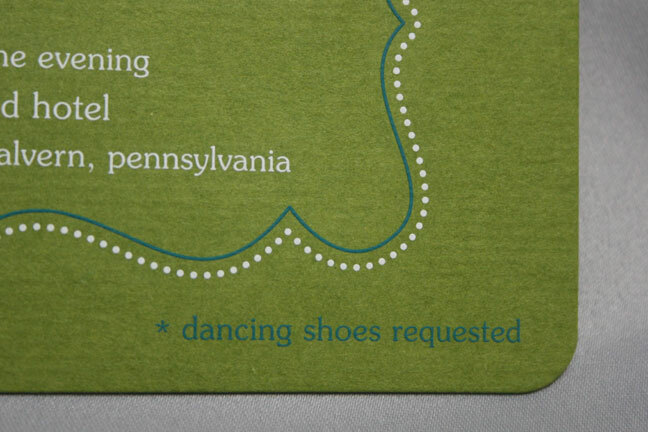 I love the dancing shoes detail! Makes it more unique and special. 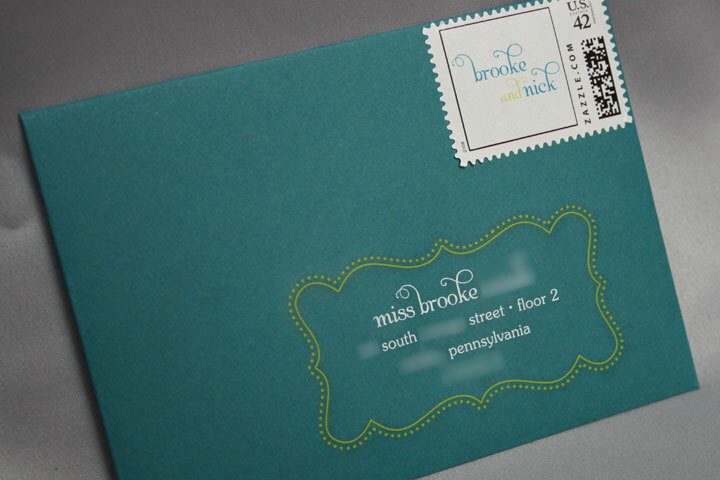 Hey Brooke- The Wiebners shots of your invites are gorgeous and I had to come and tell you how much I loved the photos! Everything looks gorgeous! 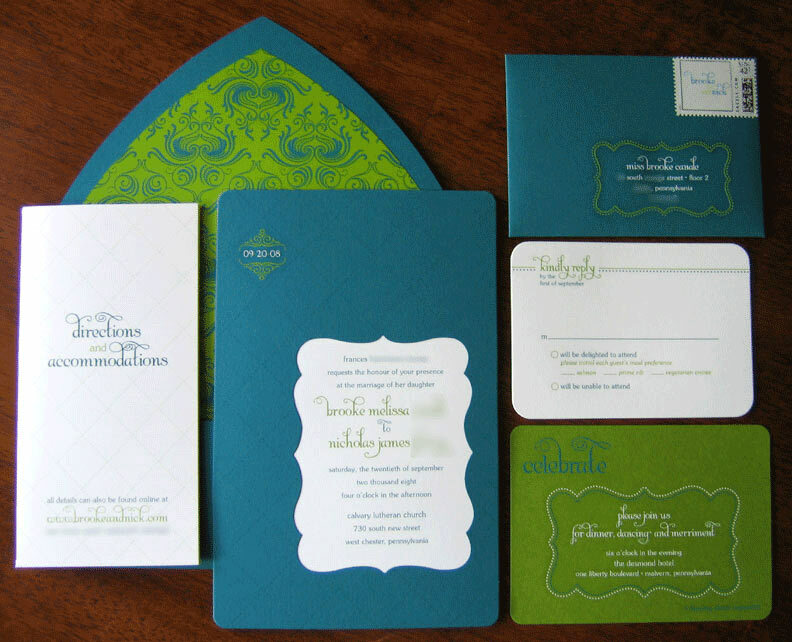 May I ask what colour ink (PMS or CMYK) the teal and green are?